Seattle, WA — An entire wolf pack has been marked for slaughter by the Washington Department of Fish and Wildlife. The decision was made to protect a nearby cattle farm after several cows were found wounded or killed. Throughout the 19th and 20th centuries, gray wolves roamed North America by the hundreds of thousands. However, as America’s demand for meat grew, the wolves became viewed as vermin and pests — they were slaughtered by the tens of thousands. As a result of this slaughter, wolves were nearly wiped off the face of the lower 48 states. They were hunted to the verge of extinction and all but disappeared. The federal government then intervened and placed the wolves on the endangered species list in accordance with the Endangered Species Act. Slowly but surely, the wolves began to grow in numbers; nothing like their previous numbers, but a small increase nonetheless. In a tragically ironic move, however, the same government who once protected the wolf has now marked them for butchery. Earlier this month, five cows were found dead or injured, at which point the WDFW authorized a ‘partial pack removal.’ State agents killed two female wolves, and the cow deaths appeared to stop. There appeared to be a disturbance in wolf activity and operations paused, according to Donny Martorello, Wolf Policy Lead for WDFW, reported KING 5. But this cessation in wolves being wolves only lasted a couple of weeks. On August 19, more cows were injured or killed. The WDFW then authorized the slaughter of the entire pack living in Profanity Peak in Ferry County. This move by the WDFW to slaughter the wolves in the name of beef farming has, understandably, created a firestorm of backlash — especially considering that they are still on the endangered species list. The WDFW is remaining tight-lipped on the total number of wolves they’ve slaughtered already and urge the public to leave the killing to them. “We are kindly asking for a little space and understanding so we can maintain the highest level of safety for the public, the staff and our producers,” Martorello said. Protecting your own property or animals from an attack by predators is most certainly a just act. However, this is not what’s happening. 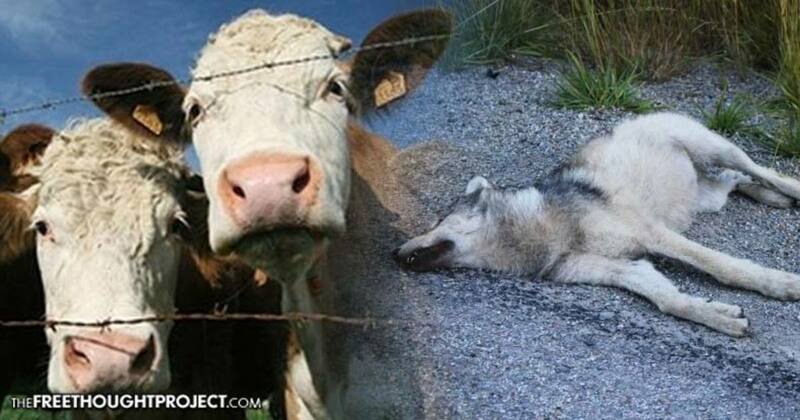 These are privately owned cattle being protected by the state at the expense of wolves. Acting on behalf of beef producers, the government is breaking its own laws and spending taxpayer money to kill off an endangered species. Instead of having the farmers come up with innovative ways to prevent herd loss, they simply lean on the government for help. And, this help is in the form of taxpayer-funded killing. It seems the beef industry in America has friends at all levels of government — some of whom are even willing to kill endangered species for them.